Women's 'State' cream Melton wool and cashmere coat from Vivienne Westwood Anglomania. Fastened with an asymmetric button closure, the tailored coat is cut for a slim silhouette and constructed with a fitted waist, high structured collar and raised hemline. 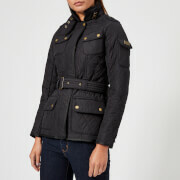 The back of the coat features slimming seam detail and a single centre pleat. 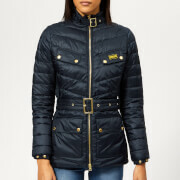 Complete with a signature gold orb lining, two front flap pockets and branded buttons. – A.D.